We are not your typical volunteers. I am a parent of an adopted child from Quito. When we adopted our son in 2011 we briefly met these really nice young people who were there volunteering. We ran into a few different volunteers while traveling around the area and everytime we did our son ran up and hugged them so tight. I could tell that these young people were so very special to the children. From that time on I have wanted to be one of those volunteers and give back to other children what my son received ..... unconditional love and my time. I later found out that these volunteers were from OSSO. I have followed OSSO since. In 2018 I decided it was time and my now 11 year old son wanted to come too. In October we traveled to Cuenca and spent two weeks there. My son was asked many times why he wanted to go and he always replied "the food and to play with the children"! And that is exactly what he did. 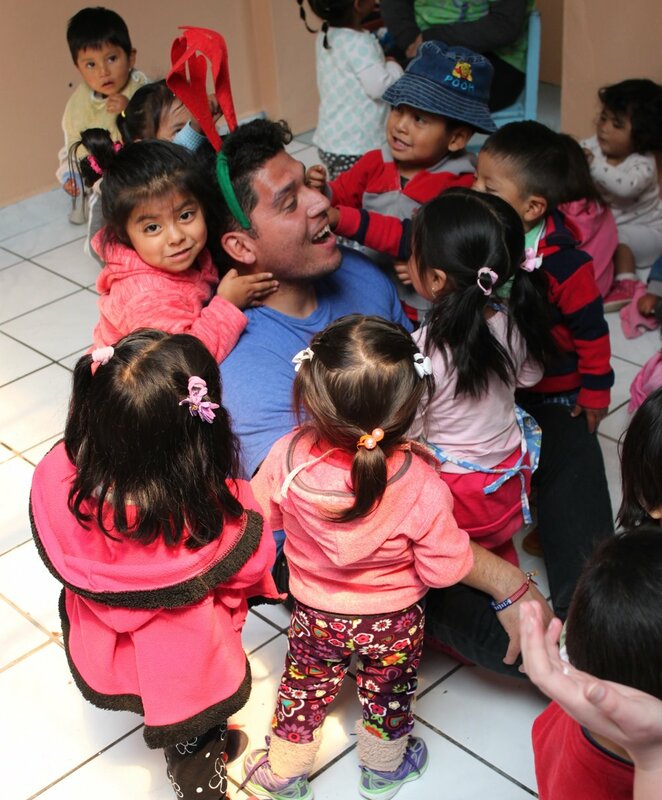 He became a big brother, little brother, friend and amigo to many of the wonderful kids that we got to spend time with. He was in awe as to how happy they all were. As we traveled around to other orphanages he couldn't wait to meet up with the buddies he had made. They were excited to see us arrive and sad to see us leave. He taught a few kids how to catch grasshoppers, build a racetrack, do handstands and make paper airplanes. The experience was very hard work at times but priceless to see my son give to these children exactly what they wanted and needed...and exactly what he received when he was a child of an orphanage. I feel it gave my son a sense of who he is and what his life was like when he was a young child. He saw the love that these kids and himself were surrounded by. "You’ll never forget this experience. 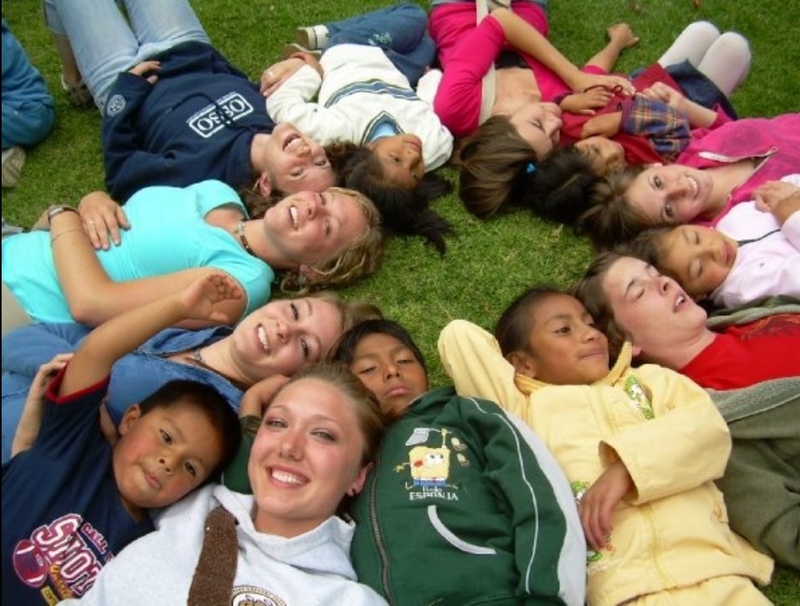 I’m going on 12 years since I volunteered in Ecuador and I STILL think of those kids, pray for them, relive my memories, and count the whole thing as a huge life-altering blessing." Although you may feel 'done' when you get home, we have many options for alumni to continue supporting the children that they love. You can become an orphan advocate, a sponsor, volunteer again at a discounted price or help us spread the word to family and friends. You can continue to help those orphans even years later! "It’s hard work. But anything that is worth it, will be. To change a life (yours or the children’s) takes effort. But, to make a difference in this world pays off ten fold and is priceless to oneself." We require volunteers to work shifts of 5 hours twice a day. We do allow volunteers two shifts off and one full day off every week to rest, tour the city, etc. The work can be tedious, long and hard work! "It’s a blast! The getaways are awesome. The country is BEAUTIFUL. The people are amazing and intriguing. And the food is delicious." We offer many different field trips and excursions for our volunteers in between shifts or on their days off. Those volunteers that are long term (4+ weeks) will also be able to go on our 3 day excursion to Banos Ecuador. "You will wonder how you can leave and really go back to “normal” life. It’s a trip." "It’s worth every penny. And don’t be afraid to use the fundraiser ideas on the website." Our prices may seem high to some, but we are paying for your room and board, field trips, transportation, your OSSO sweatshirt and a donation that goes directly to the orphans. We have LOTS of ideas on fundraisers and those that choose to do them, are very successful! "Your eyes will be widened and your heart is going to grow in ways you didn’t expect." "Those very real kids need you." From our director "The children go each week. It really was a miraculous blessing that it happened. Keenan happened to be with some of our friends at the spa and while they were chatting with a man there, Keenan had mentioned the our OSSO children used to go to horse riding at the Calvary base down the street from OSSO. The man actually owns and runs a horse training facility and said that a woman was running a hippotherapy section. Long story short, she (Carol) invited us free of charge to ride every week and to pay for the transportation to get there and back from OSSO. We now take all the casa children (those who aren't in school or are pulled out) and the OSSO children every Tuesday. Carol studies hippotherapy (or horse therapy) in University and even in Spain for a while. She has 3 different groups come including a down syndrome group and an autistic group and many other individuals. The children ride the horses in various different positions to increase movement, balance, relaxation among other things that you can look up online. Interaction with horses has proven to be very emotionally stimulating as well. Some of the positions include riding backwards, to each side, on their backs, on their stomachs and leading the horse by hand if the child walks. While on the horse, those children that are able to, are sometimes asked to do a task like throwing a ball through a hoop. These things help them balance and stimulate them. We've seen children who normally never react to much of their surroundings just cry their eyes out on the horse. Although it may seem disturbing to witness or hear, it's actually a great experience. That child is able to react and express emotion and is stimulated by their environment. You can watch some children get on the horse worried and tense at first and then just melt like butter by the end, at one with the horse. Some of the children have grown accustomed to going each week and one now heads straight to the horse in the arena and climbs up the steps and swings his leg over the horse without even being prompted practically. We have had multiple volunteers ask, "Do you accept male volunteers into your program?" The answer is YES! Although the majority of our volunteers are women, we DO accept men as volunteers and LOVE having them! Although women make great volunteers, we realize that the impact men have on children is a very different and special type that cannot be duplicated. We researched and found some outstanding facts about having a male presence in the orphanages. 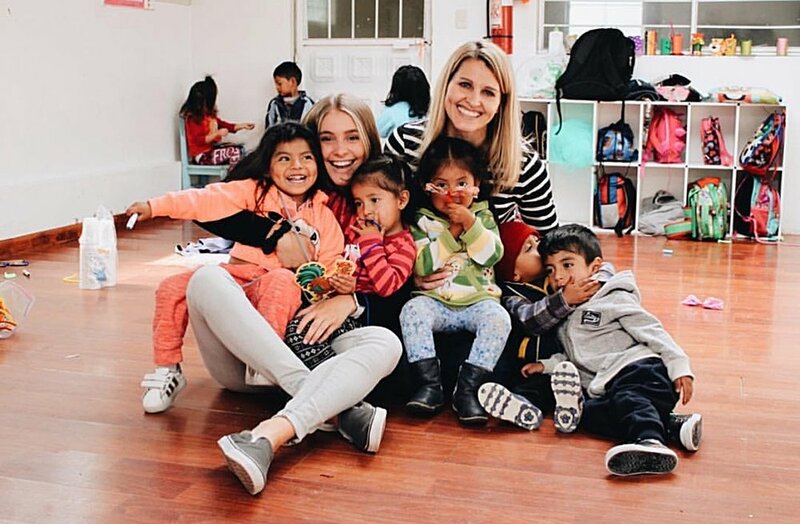 Trinidad, or Trini, as it is known here at OSSO, is an adorable daycare up in the mountains of Cuenca. The children who go to school here come from poor, hardworking families. The kids come here during the day to learn and play and occasionally spend time with our volunteers! None of the children at Trini are orphans or looking for a new home. You will usually go to Trini only once during your time at OSSO, but you may have a chance to go again the longer you stay! An average day at Trini might sound something like this. "After about a 30 minute bus ride, part of it through some beautiful mountains, we arrived at this cute little preschool called Trini. We walked inside and immediately were ambushed by a ton of little kids! They grabbed our hands and took us back to their classrooms, all the while asking us questions in rapid fire Spanish. Once we got to their classrooms they begged us to open our activities bags, but after being shushed by their teacher, they calmed down and patiently wait for us, well as patiently as two and three year olds can. Finally the teacher gave us permission to do our activities with the kids. We pulled out books, blocks, bubbles, coloring books, crafts, puzzles and so much more! The kids were so excited! Immediately I had several children in my lap, begging me to read them a story in my broken Spanish. They watched and listened intently as I struggled to get through the story. As soon as I was finished, another kid was pulling me over to help her with a puzzle. We played for a little while longer before it was time to clean up so the kids could have snack. While the kids ate their fruit, the teachers had us sing songs and do silly little dances for the kids. I think that we entertain the teachers more than the kids when we do this! After snack, we went outside and played on the playground. We took turns catching the kids as they went down the slide and pushing them on the swings. When we started blowing bubbles the kids went crazy! They were so excited! All too soon it was time to say goodbye. The kids didn't want us to go and they all ran and hugged us at the same time! It was so cute. We finally were able to free ourselves from their grasps and get back in the bus. I am so glad that the directors took some pictures of us here so that I can have something to remember them by. And so I can have something to post on social media to show my friends and family members what I've been doing here!"